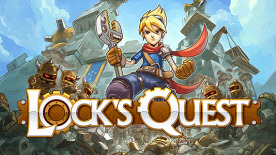 Build defenses and battle against the Clockwork horde in the next generation remake of the critically acclaimed 2008 Nintendo DS title, Lock's Quest! You play as Lock, a boy who stumbles upon an invasion of his Village, which triggers a wider war between Kingdom Force and a revived Clockwork Army, led by the nefarious Lord Agony. A gripping story unfolds as you progress through 75 Days of warfare, across a dozen unique maps, aided by a collection of turrets, traps and special attacks. Experience the game as it was meant to be, with a high-quality soundtrack, new high resolution portraits, and revised gameplay with support for both Keyboard / Mouse and Gamepad!